2015 Update: The following products are now branded as "low glycemic" ice cream instead of "a little less indulgent". 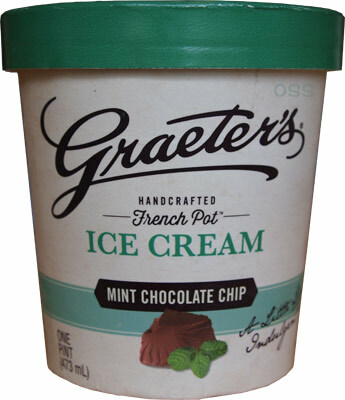 I have checked with Graeters and only the packaging/naming has changed. 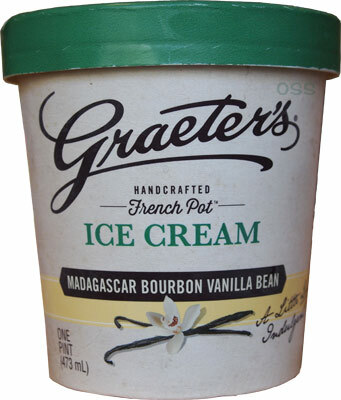 [New for 2014] Graeters isn't just offering up four new gelatos this year, they also came out with a line of "A little less indulgent" ice creams as they call it. Nick and I both received two free samples out of the three new flavors available, so here's our all encompassing review, enjoy! roll that beautiful (vanilla) bean footage! 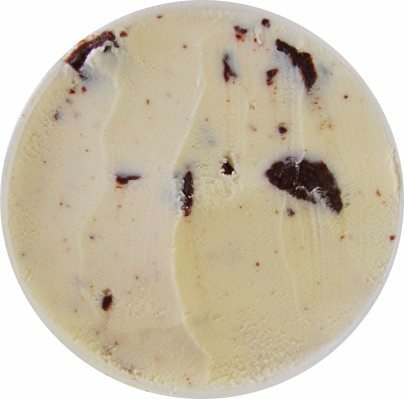 Dubba's Scoop: I take a few bites and it's not quite the same, but at 25% less fat I can't expect it to be identical. Not only is the texture different, but there's something strange about how the vanilla extract comes across. It's almost as if I can taste it directly rather than tasting the flavor. Ahh, I'm having such trouble conveying what I mean here. Their regular vanilla ice cream is what I compare all other vanilla ice creams too, and that's what I'm doing here. It's not the same I guess is my point. Ok, ingredient check. Well, the list is short, but notice "soluble corn fiber" is high on the list. Hmmm, guess that explains a lot. 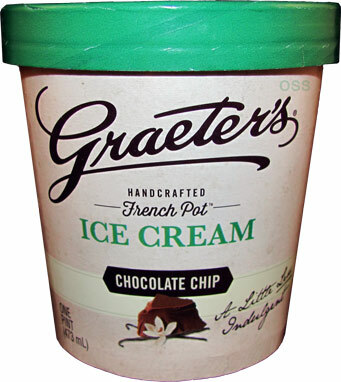 Nick's Scoop: I was also sent a couple of Graeter's "Light" line. I agree with Dubba for the most part with their Madagascar Bourbon Vanilla Bean. The vanilla is strong here but I enjoyed it. There is something up with the texture, it's not bad but you'd be able to tell you're not eating a regular Graeter's flavor. Dubba's Scoop: Now before we get started, I need you to keep in mind that overall, this is an nice product. I had a lot trouble stopping myself from eating the whole thing. I know it may seem strange that I pick on quality products but it's just me (and Nick) letting you know something is good, but not great. See, this has a nice, true minty flavor with a little bit of tingle, but I just don't adore the texture. I appreciate less fat and less sugar, but there's something about the way it conveys across your tastebuds that doesn't sit at 100% for me. Something is amiss for me. Maybe it's that corn fiber throwing me off again. HAHAHAHA! Here's one of Graeter's infamous gigantic chocolate chips. The good thing about huge chips is that it's easy to grab one and diagnose that it's more of a milk chocolate (or semi-sweet chocolate chip). I'm guessing Nick would say he wishes these were dark chocolate instead. 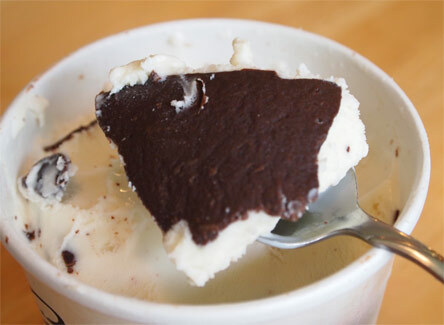 The weird thing for me is that when you get a chunk this huge and then give in to the temptation to shove the whole thing in your mouth, you wind up inhaling so much chocolate that you drown out the mint flavor for the next few bites. Nick's Scoop: Instead of a pint of Mint Chocolate Chip, I received their Chocolate Chip ice cream instead. This is where Dubba and I differ. While he thought the chip flavor was just good but not great, their Chocolate Chip flavor is beyond great. I'd even go as far as to say that it's better than their regular Chocolate Chip ice cream. You see what won me over with this pint was the chocolate chips. I'm not a fan of the chocolate chips when they're gigantic but I love the quality of their chocolate. Thankfully I didn't encounter any of those ridiculous sized chips in my pint. Don't get me wrong, the chips were still big but nothing that required difficulty to extract. I was hoping the whole line was meant to be like this but Dubba's Mint Chocolate Chip pint debunked that theory. With the chips not being huge, you're able to get a good balance of chocolate to vanilla bean with everything working in harmony. This pint was basically a Graeter's version of Stracciettla with the chips being everywhere. 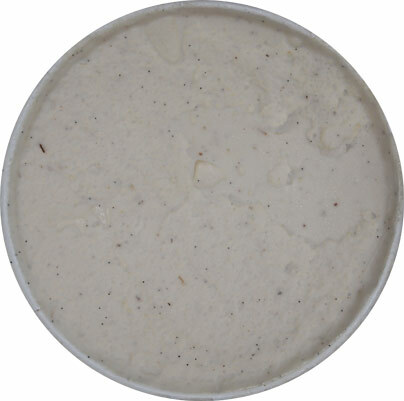 They helped to eliminate the difference in texture I noticed in the Madagascar pint as well. I'm not in the Chocolate Chip ice cream demographic but I would easily grab this one over their normal Chocolate Chip if faced with the decision. The chances of me getting chocolate chips like I experienced here might not be too high but I think the stronger vanilla presence makes this combo work a lot better than the original. So there you have it, the new lighter flavors from Graeter's. One can assume that this limited lineup is meant to test the waters for future flavors. It's definitely a quality product, it's just a question of how picky you are about different textures. With something like this, you might be tempted to think "well, the lighter version is still pretty indulgent, I might as well get the regular stuff". We shall watch and see what happens. As always, let us know your thoughts if you come across these! 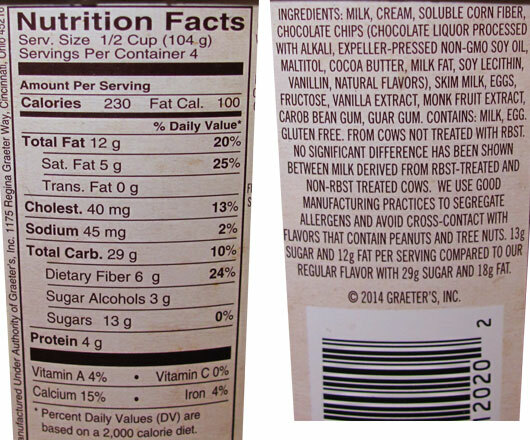 I was so happy to see that my favorite ice cream now has a lower sugar option. I tried the mint chocolate chip and its was delicious! Looking forward to trying chocolate chip.